Dr. Campos is recognized for her contributions to cotton research in the Philippines leading to the development of a package of technology on cotton production achieved in relatively short period of three years. She is also noted for deep involvement in research on the sunflower, a very promising source of edible oil and livestock feed. 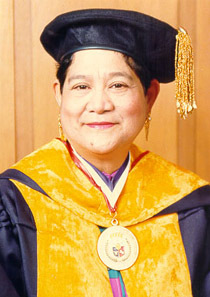 In recognition of her achievement, Dr. Campos received the following awards: PhilAAs Gregorio Y. Zara Scientists Award (1973), Ayala Award (1974) and as one of the Outstanding Filipino Scientists, Presidential Award for Public Service (1976) and Woman of the World Award (1983). 1953 - Fulbright Smith-Mundt Fellow U.S.A.
1957 - National Science Foundation Fellow U.S.A.